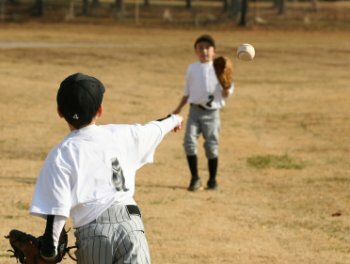 If you are looking for the basic steps in throwing a ball, then you want to check out our article titled “How to Throw a Baseball”. If you are looking for more advanced steps in throwing a baseball the correct way, then you will want to be sure and read this article, "Throwing a Baseball - And with Something On It". And one last recommendation, be sure and read the article, “Baseball Throwing Drills – Part 1. You can read Part 1 and Part 2 in either order. OK, now onto two great team throwing drills. If you are having problems with your team focusing before a game, this little drill will surprisingly get their attention. As I always recommend, be sure and stretch before throwing. A good ten minutes of stretching should be plenty. After everyone is done stretching, a jog to the outfield fence and back should get the legs warmed up also. Now everyone is ready to do some throwing. Go ahead and let the players warm up their arms by soft throwing for a few minutes. Now pair the players up and get them the proper distance apart. Proper distance for 11 and under is around 40 feet. For ages 12 to 14, proper distance is about 60 feet apart. Over 14 should be about 80 feet apart. You want to have to straight lines. Now, instead of random throwing a ball on their own, you signal when they are to throw the baseball. If there is an overthrow, you wait for that ball to be retrieved, and everyone is ready to throw again. This adds some peer pressure on the players to concentrate on throws. And it helps eliminate the typical chit chat that happens during warm ups. To add even a little more pressure, have everyone do 10 pushups on any over throw. This will wake them up. The idea is to get the players to concentrate on their throws and mentally get them prepared to play baseball. This drill is more for a practice. It starts out the same way as the last drill, with players paired off to play catch and in two straight lines. You then walk down each line and number off the players, alternating between 1 and 2. See the example below. Now the fun begins. Ones are only going to be throwing a ball to ones, in a zig zag pattern, and twos will only be throwing a ball to twos. Word of caution. Be sure the players in a line have at least ten feet between them. This is a safety precaution..
As far as how far the two lines are apart depends on the age of your players. Begin this drill by handing a baseball to the first one in a line and to the two that is first in the opposite line. Tell the players they need to communicate to each other who is next to receive the throw. Don’t forget, the ones only throw to the ones and the same with the twos. Depending on the age of your players, it will take a while before they are able to get any speed with this drill. Let them do the drill a few times, and then start a race. Again, this drill requires a heads up for safety. But it’s a great drill to start a practice. The players get warmed up and are now concentrating on baseball. We sure hope you have found some useful baseball throwing drills here. Your players are now ready to advance to pitching drills.